POTOMAC, Md. — Robert Sargent Shriver ’38 LAW ’41 visited Our Lady of Mercy Catholic Church in Potomac, Md. every day he was at home in Maryland. Every morning, Shriver could be found in the pews of the church, praying with a rosary — the same rosary with which he was buried this weekend. On Saturday, Jan. 22, less than a week after his death at the age of 95 on Tuesday, Shriver returned to the church a final time for a memorial service and a celebration of his life. The pews where Shriver once prayed were filled by more than 200 family, friends and admirers, including numerous social and political icons. It was also filled with light, pouring in from the wide windows and stained glass throughout the sanctuary. “This place looks like him, it feels like him,” former President Bill Clinton LAW ’73 said, looking around and taking in the bright and airy atmosphere as he spoke. In less than a decade, Shriver founded a variety of social outreach programs still in action today. All were designed to engage Americans in public service and provide necessary assistance to the disadvantaged. 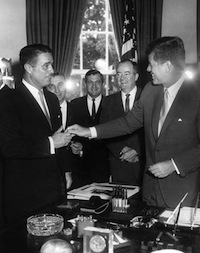 Shriver created the Peace Corps at the behest of then-President John F. Kennedy in 1961, and myriad other social outreach programs, including Volunteers in Service to America (VISTA), the Community Action Program, Job Corps and Head Start between 1965 to 1968, while serving as the first director of the Office of Economic Opportunity (OEO) — a key element of former President Lyndon B. Johnson’s “War on Poverty.” He also served as an ambassador to France in the late 1960s and ran for vice-president in 1972. Shriver consistently devoted time to new service projects, founding the Special Olympics with his wife Eunice in 1968 and the Legal Service Corporation — a non-profit corporation that provides civil legal help to poor Americans — in 1974. Shriver’s son, Mark, shared a recent anecdote regarding his father’s exhaustive list of achievements. The neighborhood garbage collector told Mark that he read about Sargent’s passing in the paper, and offered his condolences. Though it was impossible to address Shriver’s legacy during the three-hour service without making mention of his record as a public servant, speakers emphasized his faith as a devout Catholic and his dedication. With a congregation-wide chorus of the hymn “Joyful, Joyful, We Adore Thee,” Shriver’s family members brought his casket into the sanctuary, and his youngest son, Anthony, approached the pulpit to deliver the funeral’s opening speech. Anthony’s speech carried notes of his father’s levity and good humor; only moments after he began speaking, the crowd laughed as he set time limits for his family members’ speeches. Anthony stressed Sargent’s consideration for others and ability to bring joy to those around him. “The genius of my dad was that he made everyone feel like they mattered,” Anthony said. Short performances of religious songs by famous musicians including Bono, Wyclef Jean, Vanessa Williams and Stevie Wonder were interspersed throughout the eulogies and prayer. Each of Shriver’s five children — including Bobby Shriver LAW ’81 and Timothy Shriver ’81 — spoke about their father’s life and influence upon him or her. All 19 of Shriver’s grandchildren offered a short memory of Sargent, recalling his warmth and signature handshakes and hugs. “The thing I regret most is that I will never have another hug from you,” one said. Above all, friends and family remembered Shriver’s immense love for his wife, Eunice, who died in 2009 at the age of 88. Their daughter, Maria, was accompanied by husband and former California governor Arnold Schwarzenegger. During her speech, Maria said Sargent lived his life for Eunice, adding that it was clear from his affectionate gaze that she was the love of his life. Shriver’s son, Mark, talked about his father’s struggle with Alzheimer’s disease, a diagnosis he revealed in 2003. His voice was steady throughout his speech, until he discussed his father’s final years. Mark’s voice shook as he explained how Sargent’s faith comforted him, recalling an instance when his father gazed at the sunrise and expressed excitement about meeting the one who created it when he died. Shriver’s faith was an integral part of his life, Mark said, and he put his faith into action in his private and public lives. “He saw his work as a way to bring people together and help one another and spread God’s love,” said Mark. Shriver’s passion for helping those in need reverberated through the words of all who spoke to commemorate his life. But not all regarded his ceaseless energy and optimism with respect, his son Timothy said. Shriver never allowed the reactions of such cynics to dampen his enthusiasm, his family said. Clinton, who awarded Shriver the Presidential Medal of Freedom — an award granted to exceptional civil servants — in 1994, reverently touched Shriver’s casket as he ascended the pulpit to deliver part of the eulogy. Clinton lauded Shriver’s devotion to public service and reminisced about a time when Kennedy’s famous words, “Ask not what your country can do for you; ask what you can do for your country,” were hard for people to understand. Shriver, he said, was the true meaning behind the concept. Clinton said Shriver was unshakably optimistic in his devotion to his work and family. “I’ve never met a man in my life who was happier in the moment than Sargent Shriver,” Clinton said. As hundreds remembered his generous and hard-working spirit, the energy inside the church was one of remembrance, not mourning. Click here to read the article at yaledailynews.com.